I did a shoot in my new studio in the Gowanus area of Brooklyn for an new on-line retailer, The Wear. The client and I worked on the Editorial images for the shoot and a few weeks later photographed all of the clothes for what is called the 'selling shots.' The site should be launching soon. Recent commissions for an interior designer, artist and art gallery. Painting by Jeff Muhs represented by Lyons Weir Gallery, bronze sculptures by Tom Corbin. Paintings by Rebecca Dayan recently on view at Catherine Ahnell Gallery. Architect and designer, Barry Goralnick. US Rowing Team, Lightweight 8, wins the Bronze Medal ! I photographed the US Rowing Team as they practiced this summer for the 2015 World Rowing Championship in France. They took home the Bronze Medal in August! They were only .27 seconds behind second place France, with Germany winning the Gold. I made these photos from the coach's boat motoring beside the team as they launched from the Community Rowing boathouse on the Charles River in Boston. In the eight person boats there is one athlete per oar with a coxswain steering and coordinating the strokes. Unlike the old days, the coxswain does not have a megaphone, all communication is done with wireless headsets. I used alternative processes to make some of the photos. Jack Carlson, the coxswain is pictured dressed in a blazer from one of his alma maters. He recently released a book on the tradition of Rowing Blazers. More rowing photos on my homepage. Work I did for a NYC band, Fiona Silver. Check them out www.fionasilver.com More shots on my website. New work for TM 1985: American-made Accessories, Bags and Wallets inspired by vintage military, utility and artisan goods from a golden-age of manufacturing. TM 1985. American-made Accessories, Bags and Wallets inspired by vintage military, utility and artisan goods from a golden-age of manufacturing. Until June 6, a body of my work is on exhibition at the Zuckerman Museum of Art in Kennesaw, Georgia, just outside of Atlanta. I was curated into a portrait-centric group show, Pause, alongside great artists such as Andy Warhol, Rineke Dijkstra and Dawoud Bey. On display I have four 30"x40" hand printed old school black and white photos of people that have had Near Death Experiences along with their stories of when they visited the world 'in between' life and death during accidents or illness. Below is an installation photo of the work which can also be found on the home page of my website under NDE, (Near Death Experience). Another photo below shows reading material on hand at the exhibition that viewers are encouraged to read while viewing the work. The photo shown below of someone holding the story of 'Scott,' went viral on the web a via Imgur and Reddit with over 230,000 views and a thread of almost 200 comments. Will be hard to top that reach for my future work. Special thanks to Theresa Bramlette Reeves for curating me into the show and Ilia Varcev, a fellow artist and photographer from Atlanta for his friendship and encouragement during the last ten years. I've just started a new project that continues my metaphysical exploration. The image below is a tintype of Rachel and a letter that she wrote to her grandmother who passed recently. We did a ritual as follows: Light a candle and announce why we are gathered and to whom we wish to communicate. Sitter will pen a letter written in white on black paper. We move in front of the camera where the candle and letter are set to the side and then read aloud by the sitter. After reading I make a photo of the person on tintype material and film, then I photograph the letter on tintype and film. I process the tintype on the spot and give it to the sitter. We then offer spoken wishes to the recipient of the letter and ignite the letter with the candle. The tintype is given to the sitter as a record of our communication - I'll make a digital copy of it for my records. At a later date with my film I will be able to produce separate objects, not sure what format yet. I think it's important for me to give away the tintype as it's a unique object made at that time-a very personal record of the event. I'm also thinking about having the candle and perhaps ashes all be kept by my subject. I'm very pleased many people I share my project with want to participate, looking to do this ritual with all kinds of folks with varied spiritual beliefs. I'm releasing to the world this photo of me with Alex Castro, a photographer and son of Fidel Castro, in celebration of the U.S. government's statement today that the Embargo has not accomplished the goal of toppling the communist government in Cuba. The Embargo will be eased with the aim of helping the Cuban people. If you don't support Fidel Castro and his dubious humanitarian record, you have every right to do so, but that aside, we have the opportunity to help millions of people living 90 miles from our shores. The ineffectual Embargo has been used as a political tool to cement Republican Party support in the state of Florida which holds a large 29 votes in the electoral college. The past two elections Florida leaned Democratic, allowing Obama wiggle room to roll back McCarthy-era policies toward Cuba. As loyal citizens we must respect our country's decision to implement this change in the same manner we followed the rules of the Embargo. I was lucky to go to Cuba legally with an Artist Visa. After traveling and living in Cuba for over 6 weeks, my take away is that it's less Communist and more Socialist. I'll defend my argument visually. Matthew is a painter whose work brings attention to the interconnection between art, science and spirituality. His website is here. The first photo below is a distressed 8x10 plate, the other is a 4x5. Some shots from late spring when I started using a fresnel. This plate was a aged a little too much, but still like the shot. Album cover I did for a cool band, Detroit Rebellion, is out now. Also have an image printed on the CD. They have a great video comprised of footage from the 1967 riots in Detroit. Get their CD here. The images are a bit warmer than the original photos, but the designer used creative license to produce this great vibe. Paul Lowe, the man behind Sweet Paul magazine, wanted to me do his portrait so we finally were able to coordinate a sitting. It is necessary to use a very bright flash to make a tintype and Paul exclaimed, "I can feel that thing hit me!'" as the strobe fired through my fresnel 5 feet from his head. Within a few days the photo was framed and installed on his office wall. Reminiscent of Hemingway we thought. Below is a still life I shot last year kind of Sweet Paul -ish. Not sure if we went back in time a few thousand years or to the future a few thousand years but these shots could be from some Gladiator movie set or Game of Thrones. Thanks to Xavier Soto for hair and make-up and Kristin Hood for styling. We had Toma from ONE Model Management and Jeff Thomas from Adam Models. We did 4"x5" and 8"x10" tin type plates at the home studio. Xavier is a cool hair stylist that has been helping me on shoots...Will post some shots from what we have been doing soon. Thanks to the team and Jimmy, the Viking. Thanks to Jimmy Larsen, of ONE model management, wardrobe stylist Gabriel Trivelas and groomer Gendala KelliAnna. We warmed up with some 4x5 tin types and proceeded to make some great 8x10 plates. Jimmy wowed us with his stories of his life in his home country, Denmark where he lives like a modern Viking, spear fishing under frozen water. Ask him how many martial arts styles he has mastered if you ever meet him! 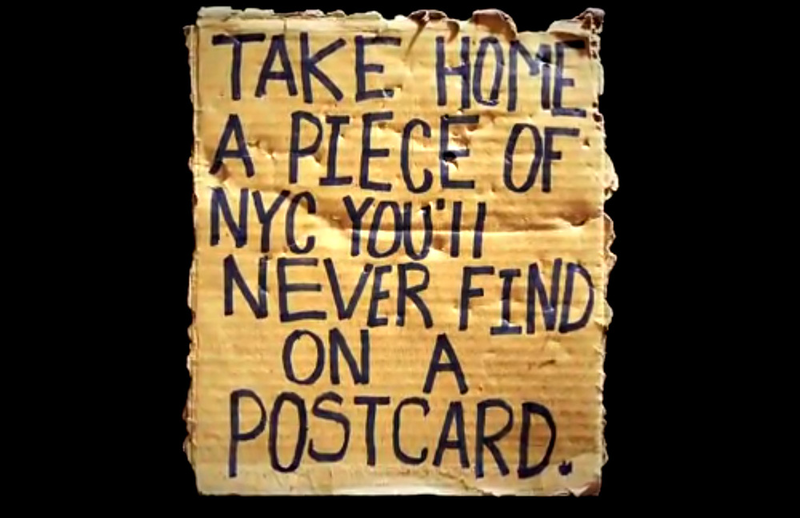 In an interesting recent project, Andres produced a video of a collection of signs he bought from homeless people titled Sign of the Times. I was knighted the (digital) photographer and Andres took on the role of Art Director/Producer. Typically Andres shoots on film and his final works are color photographs. He prefers this medium and both his collectors, and the art world generally expect him to work with traditional photographic media (film and paper with photographic emulsion). However, the final piece for this project was not to be a printed photograph, but a video, so he felt free to use digital photography as the medium for its production. I believe that he got the idea to create a video of still photographs from a video he produced earlier in 2013 of stills from the Cuba project that was shown only at a two-day video festival on June 28, 2013 at Musée de l'Élysée Lausanne in Switzerland, a photography museum. Sign of the Times is now being shown at Yvon Lambert Gallery in Paris along with his wonderful large scale color photographs from Cuba. It was a great pleasure to work with him on Sign of the Times. We spent several days shooting and lighting to impart the mood he was after for the final piece. A man named 'Vinnie' worked with Serrano to put together the the final video from the still photos. Here is an interview with him about the piece and a link to the video or you can click on the photo above to go straight to the video. After more than a year, our work from Cuba has it's first exhibition at Serrano's Paris gallery, Yvon Lambert. I'm happy the poster for the show features a Still Life image, for, in Cuba, Serrano broke away from the portrait-centric work he has been known for in recent years. Sure, in Cuba we did portraiture, both in studio and environmental, but we also did a generous amount of still life, interiors, exteriors, shots on the streets, in stores, even men on horseback galloping down a mountain trail that we lit with strobes! Here is a review of the show featuring some photos that are included in the exhibition: link. Next stop for the work is a gallery in Belgium this spring, then two museums exhibitions, one this year and one in 2015. I'll let you know when the work comes stateside!